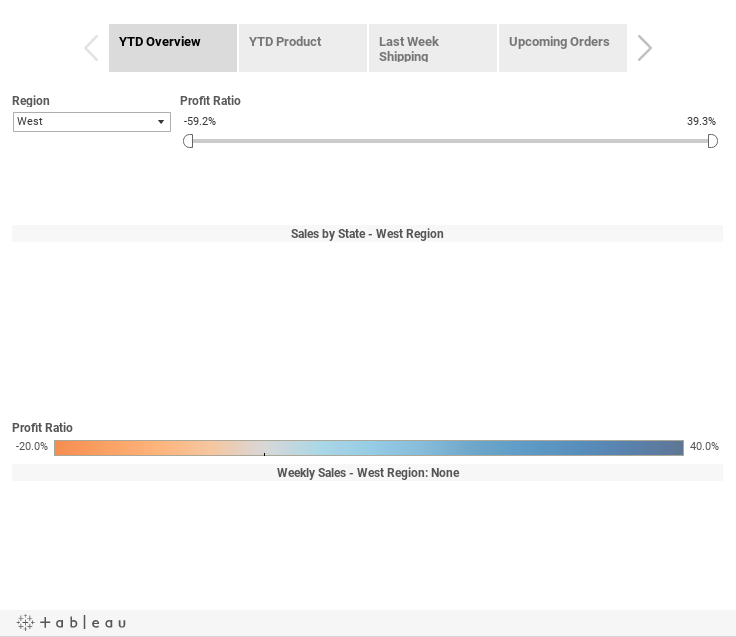 Note: This is the last installment of a three-part series on designing mobile dashboards. The first piece included tips on setting a focus, and the second installment discussed designing dashboards for both orientations. So you have your focus and your orientation. Now it’s time to design your mobile dashboard. Keep your dashboard design simple and targeted. Follow these tips to design a new dashboard or transform an existing dashboard for the small screen. Simple chart types like line charts, bar charts, area charts, and highlight tables are great for mobile dashboards, particularly when paired with high-level summary stats. Simplified field maps and dot maps are great, too. Be sure to turn off the map selection and search toolbar. You can also turn off the pan-and-zoom option from the map toolbar to keep the map from sliding when users swipe up and down. Another trick to simplify your views and save space is to create filters with parameters. Instead of using one measure at a time for a series of similar charts, make just one chart and give users parameters. That way, they can choose which measures they want to use for that chart. Try to avoid complex views with many dots on them. A scatter plot with hundreds or thousands of marks, for example, can create huge readability barriers. Limit yourself to three filters or less for each screen Any more filters will cause your windows to scrunch, making it harder for the user to interact with the filters. Opt for single-select and slider filters which are easier to interact with on the phone. You can also turn the fields in a dimension into buttons, or use a simple field map, bar chart, treemap, or highlight table as touchable filters for another view. Here’s something we wouldn’t say about dashboards for the desktop or the tablet: Keep your tooltips simple. Keep the text under three lines. Turn off the command options to help keep the tooltips area small and concise. You can also use simple labels as a stand-in for tooltips. This will allow users to read the charts more easily without having to relying on tooltips on a small screen. Two views plus some simple stats per screen work great on the phone. Stack them up for a vertical design, or lay them side by side for a horizontal view. Adding any more will cause reability issues or scrunched views. Keep the number of tabs in a given workbook under five. Remember, your users will be on the go. They’ll have just a little time to get to their answers quickly. An easy, short, and concise navigation will enhance their interaction with your visualizations.